Morocco is a land of harsh contrasts with the Mediterranean to its north and unforgiving Sahara to the south. However, Moroccan cuisine is more subtle and delicate than many other parts of Africa. It features an extensive range of aromatic and flavoursome spices, nowhere more apparent than in its wonderfully sophisticated blends. In every city spice merchants are abundant in the narrow, bustling alleyways of the Moroccan souks. 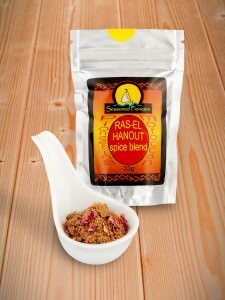 Each trader competes to offer their own unique blend of the most famous Moroccan spice blend of all, Ras-el-Hanout. 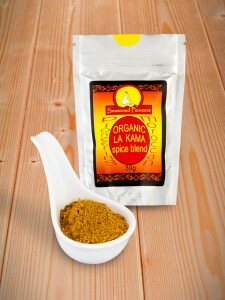 Translating as top of the shop, the title reflects that the blend contains the very best Moroccan spices available to the merchant. Secret recipes are closely guarded, handed down from generation to generation and are always a complex blend of numerous Moroccan spices. One of the oldest traditional methods of Moroccan cooking is the tagine. Tagines are rich, highly spiced stews, slow-cooked over charcoal in earthenware pots with conical lids, enabling the dishes to cook in their own steam. 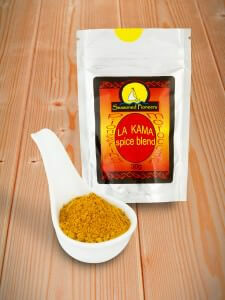 Another Moroccan spice mix that is frequently used in tagines is La Kama. Described as sultry to spicy, this has a sweet, peppery flavour and is the perfect Moroccan spice blend to use in chicken tagines. A Moroccan meal would traditionally consist of several courses, perhaps commenced with a mezze, a selection of dishes that can include olives, flatbreads and salads sprinkled with Moroccan spices such as cumin or coriander. The main course, possibly a tagine, would be next, followed by a carefully prepared dish of couscous flavoured with dried fruits, nuts and Moroccan spices. Fresh fruit, pastries or creamy desserts will traditionally conclude a meal, accompanied by a glass of mint tea. 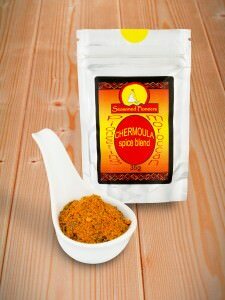 Chermoula is a Moroccan spice blend that is particularly suited to fish and vegetable dishes. 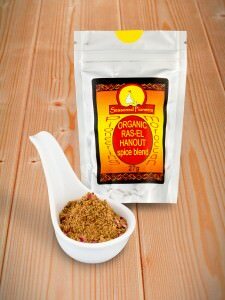 It is a classic Moroccan spice mix of herbs, spices, garlic, lemon and seasoning and when combined with olive oil and lemon juice it imparts a distinctive, fresh flavour and citrus aroma with an underlying kick of heat. Not strictly classed as Moroccan spice blends, but equally important in Moroccan cuisine are the spice mixes of Tunisian Tabil, Middle Eastern Zahtar (Zaatar) and African Harissa. 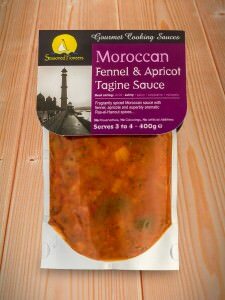 If you aspire to prepare authentic Moroccan cuisine, simply stock up with the essential ingredients of preserved lemons and the Moroccan spice mixes that we offer and enjoy delicious results! If you have any queries or recipes to share, do contact us.